Year after year, the VW Jetta never fails to impress its new and returning customers with a great assortment of both familiar and innovative features. That said, it's not exactly easy keeping track of all those features, let alone which ones are available to which trims and so on. 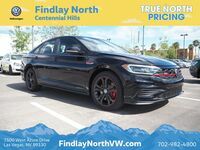 That's precisely why Findlay North VW is here with a 2019 Volkswagen Jetta trim level comparison! Before digging into all of the differences, it's also worthwhile to highlight the similarities between these models, namely the fuel economy ratings and engine specifications. As estimated by the EPA, a 2019 VW Jetta can earn up to 30-city mpg, 40-highway mpg, and 34-combined mpg. Likewise, all Jetta models are brought to life by a turbocharged 1.4-liter engine with 147 horsepower and 184 pound-feet of torque. SE – Key features include Front Assist, Blind Sport Monitor with Rear Traffic Alert, a leather-wrapped steering wheel, a panoramic sunroof, and so much more. Starting MSRP is $22,155. R-Line® – Key features include a variety of custom R-Line additions such as inside-and-out badging, black mirror caps, a black roof liner, a rear bumper with dual exhaust, and several other accessories. Starting MSRP is $22,995. SEL – Key features include Adaptive Cruise Control, High Beam Control, the active Lane Keeping System, a BeatsAudio® system with eight speakers as well as a subwoofer, an auto-dimming rearview mirror, and much more. Starting MSRP is $24,415. SEL Premium – Key features include remote start, an 8-inch infotainment system equipped with navigation software, side mirrors with integrated turn signals. Starting MSRP is $26,945.